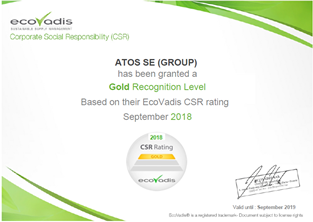 Atos, a global leader in digital transformation, announces today that it has been rated Gold by the EcoVadis CSR assessment with a ranking in the Top 1% of the most advanced companies in 3 categories (environment, labor practice, supply chain management) and a total score of 78/100. This recognition confirms its leadership position in the IT Industry as a trusted partner reflecting the work and commitment that we put into our Corporate Responsibility & Sustainability (CR&S) program. It is integrated into all our activities, supervised by top management and monitored with KPIs throughout the Group. Atos has also been working in partnership with EcoVadis to evaluate and monitor the performance of its strategic suppliers. Following this annual assessment, Atos expects its suppliers to comply with the strictest standards of ethical behavior coupled with the signing of a sustainable development charter including the principles of the United Nations Global Compact. 52% of its strategic suppliers have been assessed by EcoVadis in 2017 representing 54% of its spend with an objective of 70% of spend by 2019. The Atos’ ethics and compliance culture supported by a strong governance helps to minimize risks and ensures a sustainable supply chain. The Global Reporting Initiative (GRI) once again recognized Atos’ Corporate Responsibility Report had successfully fulfilled their requirements in accordance with the International Integrated Reporting Council (IIRC). The CDP ranks Atos on the A climate list recognizing the Group as a global leader in the IT sector for its actions to reduce carbon emissions and mitigate the business risks of climate change. The Dow Jones Sustainability Index (DJSI) World and Europe ranked Atos n°1 as the most sustainable company in its industry group. An online version of the Atos Corporate Responsibility Integrated Report is available here.